A Bag Sewing Line incorporating a Newlong Industrial Bag Sewer mounted on a pedestal was recently commissioned for a Victorian stockfeeds manufacturer. The Newlong bag sewer was part of a turnkey bag filling and bag closing line supplied by Accuweigh ’s Melbourne branch. The Bag Sewing Line included a Newlong A1-PB bag sewer fitted with an automatic infeed and bag top trimming device. A height adjustable conveyor transports the filled bags to the Newlong automatic bag sewer from the AccuPak GB50 gross weight bag filler. 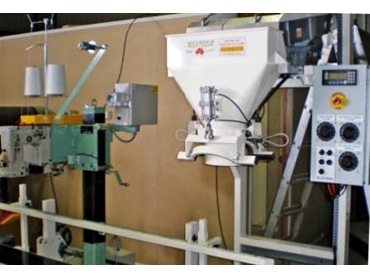 The installation of the bag filling and sewing Line reduced staff operating requirements for this client to a single person whose main task is to fit empty bags to the gross bagger’s pneumatically operated bag clamp. In between fitting bags, the operator also trains the bag tops for entry into the Bag Sewing Line. Accuweigh is Australia’s largest weigh packaging company with branches in all mainland states offering full after sales service and support available on all weighing, packaging, bag filling and bag sewing applications.